Moving is not only emotionally difficult, but your body can also undergo a lot of stress with minor and more severe injuries a possibility. And even if you're hiring a moving company, you need to make sure that your home is safety-proofed. When packing, make sure all moving boxes weigh less than 50 pounds. If you're unsure of a box's weight, try lifting it. You should be able to lift it without too much strain, and at the same time, you should feel steady on your feet. Remember that you have to carry it up or down stairs or a long distance to the moving truck and that your current residence and your new residence both have different accessibility issues - so keep both homes in mind. And remember the proper way to lift - never bend over to pick up an item. Squat down and lift with your entire lower body. Rent proper equipment to save back strain and to help move larger, heavier pieces. A dolly or two will save you from carrying boxes too far. Also, heavier boxes can be stacked and moved more easily. Straps are also helpful for securing boxes and items to the dolly or to assist in lifting larger items. Before moving day, check out the area around your home and the new home, if possible. Note the closest spot where the truck can park and if you need to reserve the spot prior to move out or move in day. Check for any uneven sidewalk or walkway areas. If you have steps in your front walkway, make sure they are clearly seen. If needed, mark the steps with enviro-friendly chalk, highlighting where the step is located. 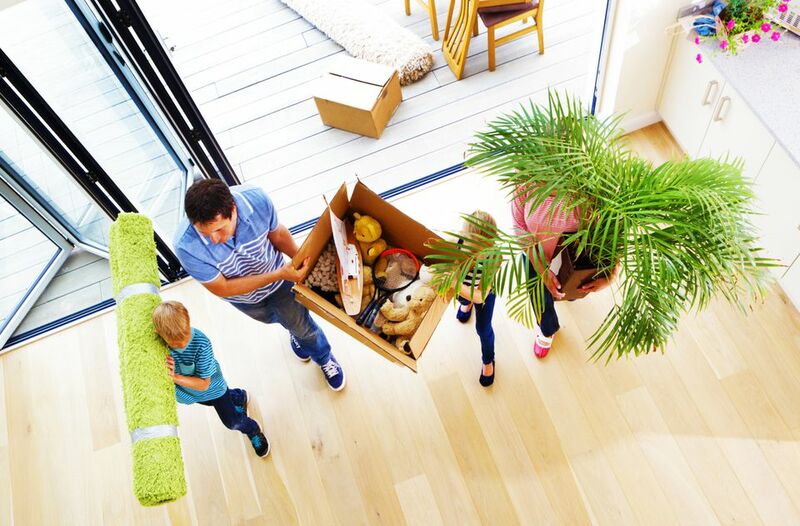 When in the middle of the move, people are often distracted and if they are unfamiliar with your home, they may not see the step. If your walkway or entrance to the house might become slippery when wet, it's a good idea to invest in a traction mat, which can be rented from some moving companies and also mat rental outlets. This is particularly important if you'll be crossing a grassy area or have uneven surfaces. Mats are also great for ensuring that movers don't accidentally walk on areas that are more fragile. Look for other hazard areas such as posts, poles or tree branches that might pose a problem for your movers. Check for low hanging obstacles or ground level protrusions and either mark them with bright colored ties (for tree branches or posts) or remove the obstacles completely. Wear proper clothing and footwear. Make sure your clothing doesn't pose a problem, such as loose sleeves or shirttails that might get snagged. Also make sure you wear durable, supportive footwear, with good grip, particularly if surfaces should become wet. I tend to wear my hiking boots that have support for my ankles and good traction on rain-soaked surfaces. Make sure no one is wearing open-toed shoes. Sandals can lead to scraped toes, or worse. Organize the space so the high-traffic areas are clear of any obstacles. If possible, have heavier boxes set aside as well as lighter, more fragile items. Make sure the movers know which boxes require special care. Have all items that need to be taken apart, ready to go. Parts should be attached to items so the movers don't need to keep track of smaller pieces. Organize the movers so that everyone has a role. This will help to avoid collisions and people getting in the way. Assembly line set-up tends to work best, with one or two people on the truck to load it while others are managing the removal of items from the house. For items that require more than two people to move, make sure you have an extra person there, one who can direct the group and be there in case someone slips or cannot carry their end of the load. The extra person can also act as the communicator. If you have children, make sure they are either kept out of the way or preferably, they are off property at a babysitter's house or neighbors. You certainly don't want to be worrying about your children's safety during a move. If you have pets, either keep them locked in an empty room - one where the movers don't need to enter - or take them to a boarding facility or at a friend's for the day. It's much less stressful for them to be away from the noise and confusion. Keep an emergency kit on hand, including band-aids, aspirin and medicated ointment. Hopefully, you won't need to use it for any major accidents, but even a blister can be quite painful if not treated. Also make sure that everyone knows where the closest telephone is, especially if not everyone has a fully-charged cell, and an emergency contact list, just in case.